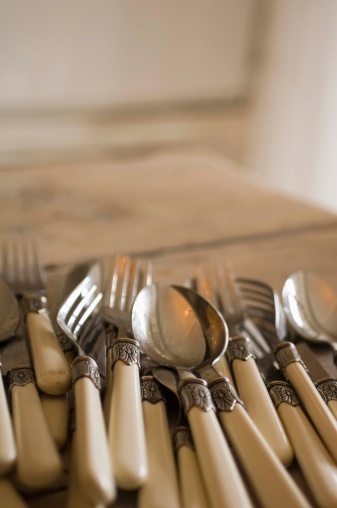 Although you want to keep your silver nice, you also want to use your silver utensils and jewelry. Silver is a very soft metal, so scratches can occur. If you want to make your silver look like new again, begin with polishing and cleaning. Prevent scratches by cleaning your silver often. If you already have scratches in the silver, clean it before you do anything else so that any dirt in the scratch crevices will be removed. Understand there is no real way to remove scratches from silver. However, polishing your silver can make any scratches much less apparent. Polish your silver with a specific polishing cloth or creme made for silver surfaces, especially if the item is an antique. Choose alternative polishing materials. If you do not want to purchase silver polish, use common household products such as baking soda or toothpaste to conceal the scratch. The baking soda should be mixed with hot water and the toothpaste must be a simple paste -- not gel -- without any whitening features. Rub the baking soda or toothpaste into the silver, and then polish it off with a clean wiping cloth. Store the silver in a snug container. If you want to prevent more scratches and minimize tarnish in the future, invest in a wooden case or other type of fitted storage box. All pieces should be completely dry before being stored. Wrap the silver in flannel or tissue paper before placing it in the storage container. Summer Banks is a freelance writer with more than three years of professional writing experience. Her work can be found on Wisegeek.com, Associatedcontent.com and Brighthub.com. Banks has four years of nursing and business education at Glenville State College and Shepherd University in West Virginia.